Israeli PM Benjamin Netanyahu bids farewell to his Indian counterpart Narendra Modi at Ben-Gurion International Airport, July 2017. Photo: Kobi Gideon / GPO via Netanyahu’s Facebook page. Israeli Prime Minister Benjamin Netanyahu and his Indian counterpart, Narendra Modi, exchanged warm Twitter greetings on Tuesday, ahead of Diwali, the annual Hindu festival of lights. On behalf of the people of Israel, I would like to wish my dear friend @narendramodi and the people of India a joyous Diwali. May this luminous festival of lights bring you happiness and prosperity. Reply to this tweet with the name of the city where you’re celebrating! 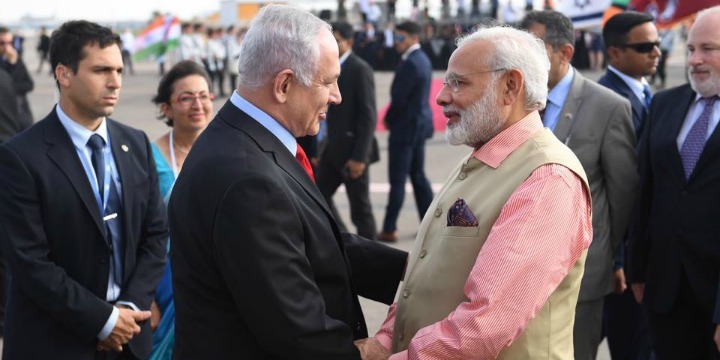 The Indian leader visited Israel in the summer of 2017, and Netanyahu toured the subcontinent this past January. Last year, Israel and India celebrated the 25th anniversary of the official establishment of diplomatic relations. Ties between the two countries have flourished in numerous realms in recent years.